And what size pots did you use in your 32x32? I only grow photos and use 5 gallon fabric pots. I used 2 Marshydro 600s in my 32x32 and got decent results. The 600w Vipar is pretty similar to the Mars. I think I paid 140 each for the lights. Like many other folks here, I started with what I thought was a good light. Found out it wasn’t enough light, bought another. Still wasn’t cutting it, bought the 2 Mars lights and was pleased but not blown away. Finally bit the bullet and sprung for good lights and am drooling over my plants. I could have saved the cost of 1 of my Quantums if I’d have understood what people here preach. If you want good weed and nice yields, you can’t skimp on lighting. Have you tried your soil mix with just water from start to finish? I love the idea of making my own super soil but I’m looking for a recipe that mimics the soil I’m currently using. I only water, no additives or amendments whatsoever from seed to harvest. It looks like an updated version of mine. It appears to have newer leds and more power draw. It’s also a bit more cash. The Vipars that you’re looking at are closer to what I have. Remember, you won’t be growing cannabis cup sized buds but 2 of the 600s will work. WOW! Those are some huge buds! Heck if i came close to half of that yield i would be happy with that lol! I see those are different strains. Did you go them all at the same time in the same tent? Yes Blueberry and Gold Leaf. Both started the same time, 100% organically, water only. What is the soil you are currently using? I’m using Kind Soil with a mix of Fox Farms ocean forest and Promix Bx as a top medium. It’s pricey but no more than any nutrient line and it’s nearly idiot proof. Water with Ph correct water and give them plenty of light, that’s all you do. Here’s my last grow with it. It goes into more detail. My current grow 5 weeks into flower. That is impressive. I have to look into that soil. Im trying to make this as painless and easy flowing as possible. 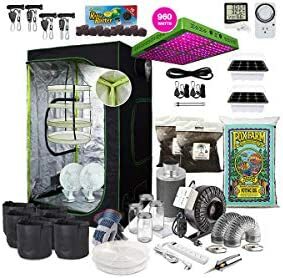 i dont think i saw this on your grow, but can you use a gravity watering system for that soil? Im unsure what that system is but if it’s an auto watering system, I have no experience. I water by hand. It gives me a chance to look my plants over for any potential problems. Thankfully, I’ve had 1 complete grow and nearly a second grow with absolutely no issues. I love this soil. What do you guys think about this all in one? That looks like a pretty complete kit. I think you can do a little better by sourcing the components separately. I like the Kind soil/Coco Loco combination but with 10 lbs of Kind soil, you can only grow 2 plants in 5 gallon bags. 3 if you put them in 3 gallon bags. You’ll still need a good ph meter and organic ph adjusters which would set you back another $75 or so. Now for the light. It looks like a Marshydro 960 which draws 410w. 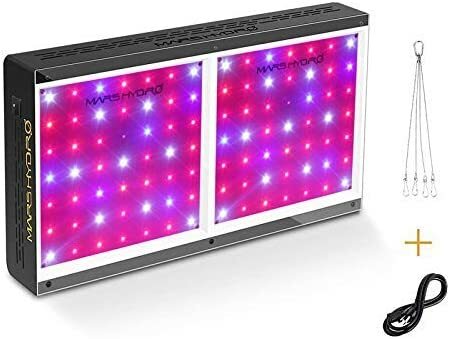 This will probably be ok for veg but once in flower, you’d probably want to be around 800w which means another light. At $340 per light, you could get much better lighting for the same price. Don’t get me wrong, I have 2 Mars 600s that have 2 succesful grows on them. Yields were good and I like them. There’s better options if you aren’t afraid to use a screwdriver and wire strippers. Just my 2 cents and it looks like a decent setup that will grow weed but I wouldn’t expect the yields they are claiming with just the single light. Im starting to get the idea now that light is crucial to success. What are some of the better options? I would be trying to stay with the LED’s if possible. I upgraded to Horticulture Lighting Group Quantum 260xls. They run about $350 each from Growerslights. They come disassembled but for an additional $35 they’ll put them together and test them. Assembly is a snap though. Well worth saving the assembly price. I have 2 of them in my 4x4. You could save even more by buying the components separately but I didn’t want to run the risk of buying something that wasn’t compatible. The kit comes with everything you need. This is what these Quantums and Kind soil can do. I’m about 3 weeks from harvest. droooollll What do you have in there, four 5 gallon pots? I think i might just go ahead and spring for a 4x4. What is the strain in the back right??? That thing is thick with buds. I run Quantum Board Kit in one of my tents and I built a LED strip light with @dbrn32 help in another tent. Then I have two other strip lights that he built for me in my veg tents. I would never run anything else besides LEDS or cobs in my tents. You can grow weed with cfl’s. But it’s really difficult to pull nice harvests with them. Really good lights can be expensive though, so make sure you’re committed to growing and prepared to make a long term investment. In hands of capable grower they usually pay themselves off within a grow or two so it’s usually worth it. Yes 4 five gallon pots. Back right is purple haze. Im actually expecting the front left (strawberry kush) to yield the most. Both are beasts one is sativa dominant the other indica.